What I grew up calling pepernoten, I have since realized is actually called kruidnoten. When I learned this, it felt like my whole world shifted. I continue to use the incorrect name, stubbornly clinging to tradition. This is not something that we made at home, but instead bought (and still buy) from Ben’s Meat Market which is always well stocked with chocolate letters and pepernoten every Christmas. I still love the crunchy, little, store-bought cookies, but it is fun to make them homemade too. 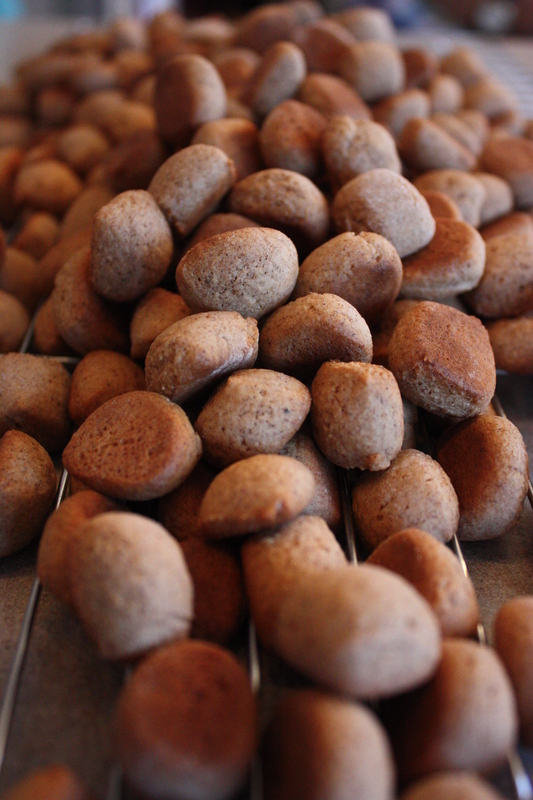 For the non-Dutch among you, pepernoten has a special place in our Christmas tradition. I went to a school largely inhabited by Dutch-Canadian immigrants, so Santa never came to our school. Instead, the more nobly-robed Sinterklaas would come with Zwarte Piet. Sinterklaas would toss pepernoten over the masses of children gathered in the gym, and we would scramble on hands and knees and try to scoop up as many as we could off the floor. I am sure that they now use a more civilized, less unhygienic method to distribute the cookies, but this was a day we all looked forward to. The cookies and waiting to see who Zwarte Piet was going to haul off in his sack to our cheers and terror. And along with a chocolate letter, pepernoten is a required part of our Christmas stockings. Rolling by logs is a faster way to make these tiny cookies. Rolling by logs is a faster way to make these tiny cookies.To learn more about Sinterklaas, check out Stuff Dutch People Like or listen to David Sederis’ amusing outsider perspective, Six to Eight Black Men, which has become another part of my Christmas traditions. While most recipes tell you to roll the small balls by hand, I find that rolling snakes of dough and cutting them is a quicker method to make even pieces. Beat in egg, butter, and spices at a low speed. Be patient, because it can take a while before the dough forms. Add in the water if needed. It should form a stiff dough. Prepare a cookie with oil and line it with parchment paper. Take a chunk of dough and roll into a snake of dough approximately ½ inch (1 cm) around. Repeat with until all the dough is rolled into snakes. If the snake is getting too long to manage, just break it into two pieces. Return dough to the fridge (30 min), or freezer (15 min) to make sure the dough is firm and will retain more of a round shape when you cut it. Cut the snakes into small pieces about ¼ inch (½ cm) long. Place on cookie sheet with some space between the cookies.